PTServidor Review 2019: Is PTServidor a Good Hosting? PTServidor is one of the most popular and trusted web hosting service providers in Portugal. They offer a wide range of shared web hosting packages with pre-installed CMS software options as well as custom server solutions. PTServidor was founded in 2006 in Lisbon, Portugal, to fill the gap in the local hosting provider market. Since 2010, it has been a brand within Sampling Line Lda. 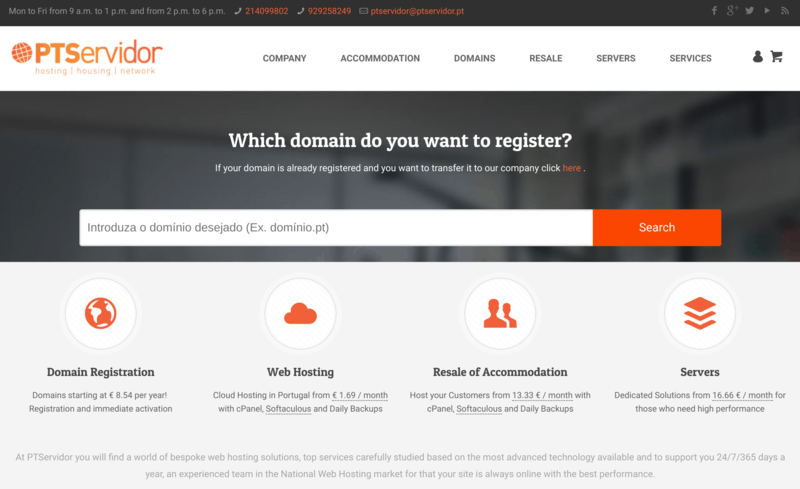 This company has grown to be one of the top ten providers of .pt domains, which makes it one of the biggest Portuguese companies in the industry. They currently host over 30,000 sites for more than 5,000 customers, and they provide a wide range of web hosting and custom dedicated server/colocated server solutions. Business is done in Portuguese. Although you may need to pay extra for some features, PTServidor does offer everything you need for a proper hosting solution. They offer two of the best hosting control panels (cPanel and Plesk), and with Softaculous you can easily install hundreds of web hosting apps with one click. Alternatively, you can take the even easier route of opting for a pre-installed CMS in the form of their WordPress, Forum, or Online Store hosting. They even offer radio streaming hosting for those who are interested, and webmail is provided via SquirrelMail, Horde, or Roundcube. All products come with daily R1Soft backups, Cloudflare, and Attracta SEO. PTServidor’s servers have N+1 backup systems, several quality certifications (ISO 9001, ISO 14001 and ISO 27001), anti-seismic structure, comprehensive monitoring systems, and redundant power supplies. They also feature 1 Gbps connectivity for servers and access to extra RAM at resource-heavy times. With VPS plans, you can choose your favorite control panel (cPanel or Plesk) and your favorite Linux flavor. Unfortunately, PTServidor doesn’t offer any free plans, trials, or money-back guarantees. Pricing doesn’t include SSL certificates but they do provide domains for free. All plans come with unmetered bandwidth and unlimited databases, parked domains and subdomains, and email accounts. You can add on DNS management and extra dedicated IP addresses. Linux Web Hosting: Four plans with bi-annual, annual, biennial, and triennial billing. Plans come with between 1 and 10 GB storage, 1 to 15 addon domains, and included cPanel. Windows Web Hosting: Plesk plus ASP.NET solutions for Windows with annual, biennial, and triennial billing. Plans offer between 1 and 10 GB storage, and 1 to 15 addon domains. WordPress or Forum Hosting: Three plans with pre-installed WordPress and options for 200 MB, 500 MB, and 1 GB of storage. Annual billing only. Online Store: More resource-heavy hosting for online stores built on their in-house e-commerce platform and with 1, 5, or 10 GB of storage. Quarterly, bi-annual, annual, and biennial billing. VPS Linux Hosting: Four VPS server configurations with between 20 and 100 GB storage, 1 to 5 TB traffic, 384 MB to 2 GB dedicated RAM, and 512 MB to 3 GB maximum RAM. You need to purchase a control panel license separately. Custom dedicated server and colocation packages are also available, priced individually based on a consultation. In general, PTServidor is expensive compared to some other European competitors, especially considering the relatively low resources and bundled features. PTServidor take pride in their 24/7/365 technical support service with rapid response times. You can reach their support team via email/tickets or their dedicated Italian phone lines. While their knowledge base and FAQ isn’t 100% complete, it’s comprehensive and structured enough to help you with most of the issues you will face. PTServidor might be one of the more expensive options in Europe, but they are trusted and relied upon in the industry. They take pride in their customer-orientated approach to hosting, and their variety of hosting solutions allow them to offer something to almost everyone. Wondering how PTServidor stacks up against other Web Hosting companies? Enter any other Web Hosting company and we will give you a side-by-side comparison.